In Family Card Games, Daddy, Mommy, Sarah, and Billy are back for some good ol' card game action! Try your hand at one of three card games! Pick from Daifugo, Speed, and Memory! 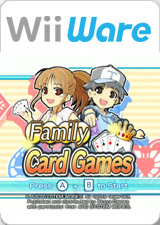 Family Card Games displays appealing cel-shaded graphics and endearing music, on top of the friendly competitive match-ups. You can play 1P Daifugo, or play against up to three other random players in an online match! You can also view your ranking and see how you match up with players around the world! Both Speed and Memory are available to play as well! Test your reflexes and card prowess against another player in Speed to see who truly has the fastest hands. Memory will test your mental capacity as you try to remember where cards and their respective match are. Do you have it in you to be both the fastest and the smartest among your friends and family? The graph below charts the compatibility with Family Card Games since Dolphin's 2.0 release, listing revisions only where a compatibility change occurred. This page was last edited on 16 January 2018, at 06:08.